Films are free and open to the public. Subtitles are in English. For decades, France has been and remains a country where directors immigrate from all over the world to make political films freely, and French productions have continuously challenged forms of power and censorship, shaping what has been called a "cinéma de résistance." Because the French film industry is currently the first most active in Europe, and notably cosmopolitan, the selected films will offer a variety of voices, perspectives, and treatments on the urgent theme of resistance. Although resistance can be mounted to many different kinds of forces, for the purpose of this film series, we have selected films, some historic and some more recent, that treat in particular resistance to political regimes, in various historical contexts. The films share a connection to France, the French-speaking world, and/or the French cinematic tradition. Screenings take place as indicated at the Columbia Maison Française, Buell Hall, 116th Street and Broadway, and at the Lenfest Center for the Arts, Katharina Otto-Bernstein Screening Room, Broadway and 129th Street. Stefano Savona, 2012, 91 min. From facebook thumbs up to the battle of stones, a history of hope, fear, despair, anger, pride and elation, Tahrir is the real-time chronicle of the two most exciting weeks in the history of modern Egypt as lived by their protagonists. FRIDAY, OCTOBER 13, 6:30 P.M.
Gillo Pontecorvo, 1966, 120 min. 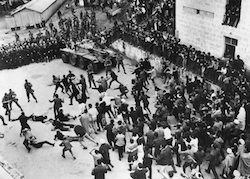 The Battle of Algiers reconstructs the events that occurred in the capital city of French Algeria between November 1954 and December 1957, during the Algerian War of Independence. The tactics of the FLN guerrilla insurgency and the French counter insurgency, and the uglier incidents of the war, are depicted. TUESDAY, OCTOBER 17, 6:30 P.M.
Peter Watkins, 2000, 345 min. On a stage-like set, more than 200 actors interpret characters of the 1871 Paris Commune, especially the Popincourt neighborhood in the XIth arrondissement. They voice their own thoughts and feelings concerning the social and political reforms. The telling of this story rests primarily on depicting the people of the Commune, and those who suppressed them. THURSDAY, OCTOBER 19, 7:00 P.M.
Jean-Pierre Melville, 1969, 145 min. Surely the most famous and subtle French production about underground Resistance fighters in Nazi-occupied France, told through a compelling thriller story. MONDAY, OCTOBER 23, 6:30 P.M.
Deniz Gamze Ergüven, 2015, 97 min. It is the beginning of summertime in the Turkish countryside. When five orphan sisters are seen innocently playing with boys on the beach, their scandalized conservative guardians confine them, while forced marriages are arranged. They all resist the best they can. Mariana Otero, 2017, 98 min. This documentary examines how the Nuit Debout (Arise at Night) protest that took place in March 2016 in Paris turned into a kind of movement in the spirit of Occupy Wall Street, a new form of democratic Assembly, without a leader or elected representatives, in which each person was given an opportunity to speak and participate in the collective. THURSDAY, OCTOBER 26, 7:00 P.M.
Olivier Babinet, 2016, 90 min. The public housing projects in the banlieues outside Paris have been the setting for many a gritty saga of desperation and despair. Swagger is not one of those movies. Instead, this joyously innovative documentary immerses viewers in the hopes, dreams, and rich inner lives of eleven teenagers growing up in one of France's most diverse neighborhoods. Support for this series on the CINEMA OF RESISTANCE is provided by the Knapp Family Foundation and the Cultural Services of the French Embassy in the U.S. Additional support provided by our co-sponsors at Columbia: the School of the Arts; MA Program in Film Studies at the School of the Arts; European Institute, Sakip Sabanci Center for Turkish Studies; Heyman Center for the Humanities, Columbia Center for Contemporary Critical Thought, Institute for Research on Women, Gender and Sexuality, Committee on Global Thought, and Columbia Global Centers.